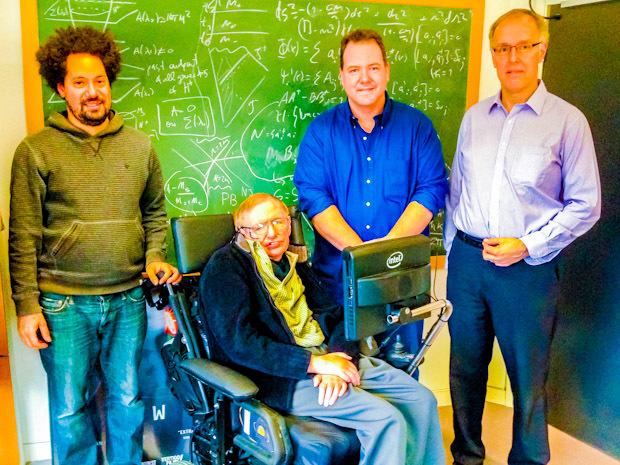 Intel engineers have created a custom-built computer system for Stephen Hawking, the British theoretical astrophysicist, for his travels. He is completely dependent on his chair for communications, now, if there is a problem he can be quickly transferred to a backup chair. Intel engineer Travis Bonifield recently returned from Cambridge, UK, after delivering a new computer system to Hawking. He's been working with Hawking for more than a decade. While Hawking has always traveled with a lengthy list of backup hardware, the process of getting everything ready to go can be burdensome. The computer itself is only one piece of the total system that includes a hardware voice synthesizer, a peripheral box filled with a range of devices including a USB hub, audio amp and hardware voice interface, the power modules and speaker. Until recently, when Hawking went on a trip, his assistants had to remove the various pieces of the system from his main wheelchair, which he only uses in the UK, and mount them onto a folding travel wheelchair. Over the 13 years he's been working on this project, Bonifield has always set up a single system for Hawking and then left behind a "bag of parts" in case something were to break or need replacing, including a backup laptop. On this trip, Bonifield and Rob Weatherly, an Intel technical marketing engineer based in Swindon, UK, delivered two complete systems, setting up one on each of Hawking's wheelchairs. The latest custom system, a 2 in 1 based on a Lenovo ThinkPad x230t powered by an Intel Core i7 processor, combines a notebook with a 12″ tablet that has a daylight readable display. The dual systems solve two problems, according to Bonifield. In past years, Intel engineers would interrupt whatever Hawking was doing to install a new system on his chair and he would wait patiently while it was mounted and configured. If something went wrong, the engineers had to tear it all off again, reinstall the old computer and go back to the drawing board. This time they simply installed everything on the travel chair first. After it was ready and tested, they moved Hawking to the travel chair while installing everything on his regular chair. The process was less intrusive than in the past and gave the engineers time to work. The second, and more significant benefit, is that with a full system installed on each chair, Hawking's assistants no longer need to dismantle and install the system on a different chair every time he travels. Now they can simply unplug the laptop (without even shutting it down) and plug it into the other chair. Hawking can now be transitioned between chairs in just a few moments, and if something does break, he can be moved to the other chair while it is repaired. The design of the system Hawking uses is pretty simple, according to Bonifield. There are a few USB devices attached to the computer along with four converter modules that run from the wheelchair battery and provide power to the various system components. Dave Rittenhouse, a mechanical engineer based at the Intel Folsom campus, designed the computer chassis and coordinated its manufacture. Rittenhouse only had to redesign the chassis for the hardware voice synthesizer card and added a few standard metal boxes for the peripheral devices. Bonifield planned, assembled and tested the electrical connections in the system, which include the power delivery, synthesizer board, the audio amplifier and the computer itself. Peripherals include a USB hub that attaches to the synthesizer board via a USB serial dongle, an audio amplifier and speaker, and a USB hardware device that interfaces with an IR sensor on Hawking's eyeglasses, which he uses to control the computer by moving his cheek muscle. Bonifield is often asked what it's like to work with Hawking and notes that the renowned physicist is simply "Stephen." Working with Hawking can be lively as there are at least two of his cheerful nursing or administrative staff nearby, while his voice synthesizer provides a constant level of white noise. Hawking is out of necessity, a person of few words and the words are direct and purposeful, but kind.